If you’re looking to add some fall flavor to your garden this season, there’s nothing that will do the job better than a mum plant! If you want to plant these blooming beauties so that they come back for you year after year, follow the instructions below, provided by Matlack Florist’s nursery manager, Penny. Choose a location outdoors for planting. Generally, a well-drained area that receives full sun or bright, partial shade is best. A protected area away from strong winter winds will help the plant to “winter-over” much easier. Remove the plant from the pot and place it in a hole no deeper than it’s original pot. Fill the hole with soil, forming a “saucer-like” lip at the base of the plant to prevent water run-off. After the plant has blossomed, cut the entire plant back to 6″ from the ground level. Mulch over with leaves to protect the mum from winter damage. Remove the mulch in the spring and the plant should begin to sprout. In June, cut the mum back to 1/3 of its size and fertilize with a general-purpose fertilizer. The mum will flower in the fall. To prevent the mum from growing too tall and spindly, cut it back again in mid-July up to 1/3 of its size. 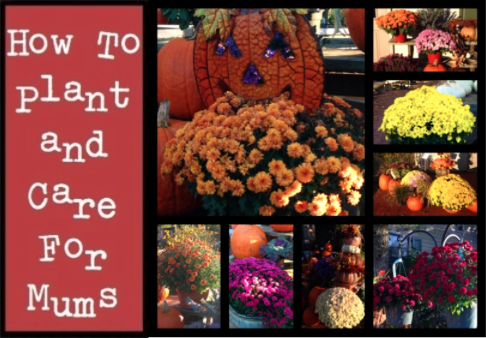 So now that you have the know-how, get outside, plant some mums, and enjoy this beautiful fall weather while it lasts!